With the fast paced lifestyle globally, finding time to just relax and socialize in real time has become difficult. Whether you use free online dating websites or chat rooms, it is the preferred choice for women and men of all ages. Gone are the days when the family members introduced the potential partners because now due to employment opportunities, people live in different cities and countries, away from the loved ones. Finding your partner at a certain age falls upon you and with hectic work hours and no time to socialize, you can only date online. With everything going online, meeting your potential partner has become easier with online dating or even online matrimonial websites. You start the process by registration on it, and creating your profile. To meet the right people, you can check the other profiles, show interest and then when it is reciprocated, start chatting. Only when you get to know each other better or feel the attraction, you meet in real time. In a way, online dating has changed the way people evaluate potential partners because you have a wide range of profiles to browse and chat with until you find the one that suits you best. 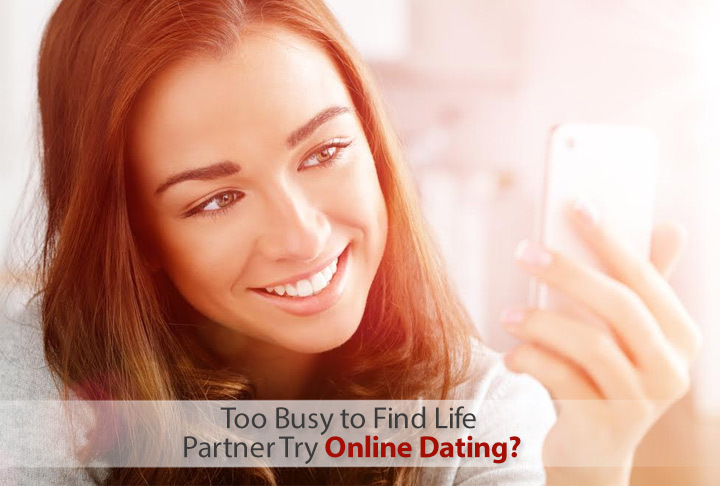 Thus if you are too busy to find life partner, try online dating. Online dating is fast, effective and helps you especially if you are an introvert and avoid social situations. Conversely, when you meet people at work or through friends, it may take a long time to develop attraction but when you date online, you only set up a meeting with the individual that you are attracted to. However, it is important to shortlist the best online dating website or if marriage is on your mind, there are plenty of online matrimonial websites that you can select. Now you know that you don’t have to be lonely any longer. Register online and meet the people sharing your hobbies, interests and personality that you are looking for. Instead of dealing with social situations to meet people and may take longer to know someone, start dating online quickly.